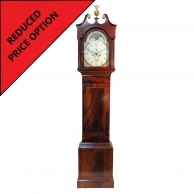 A very original and virtually untouched, large wall clock. 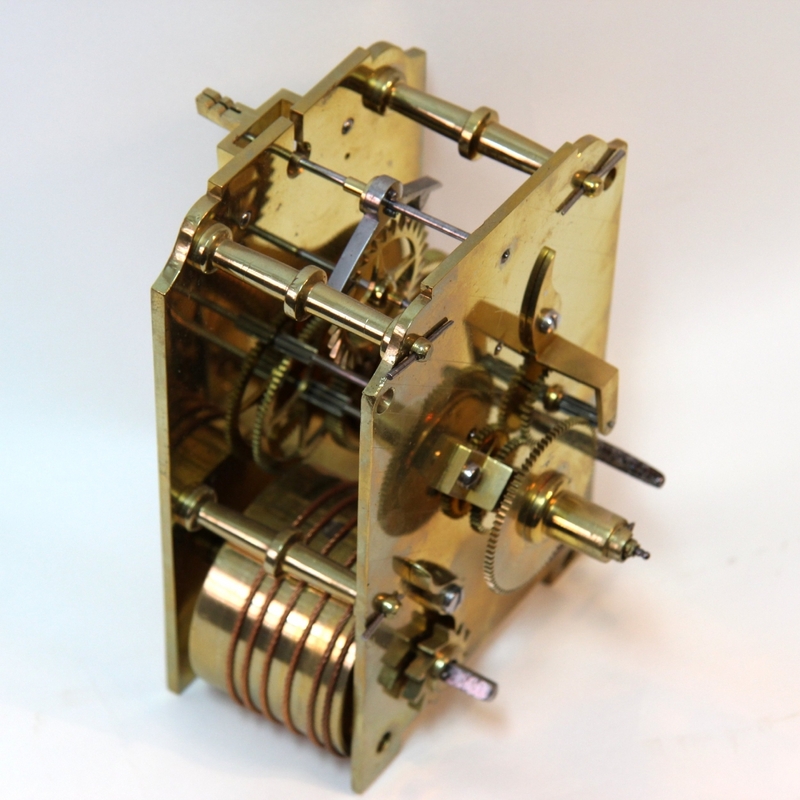 The eight day duration fusee movement with shouldered plates, knopped pillars and Anchor Recoil escapement. 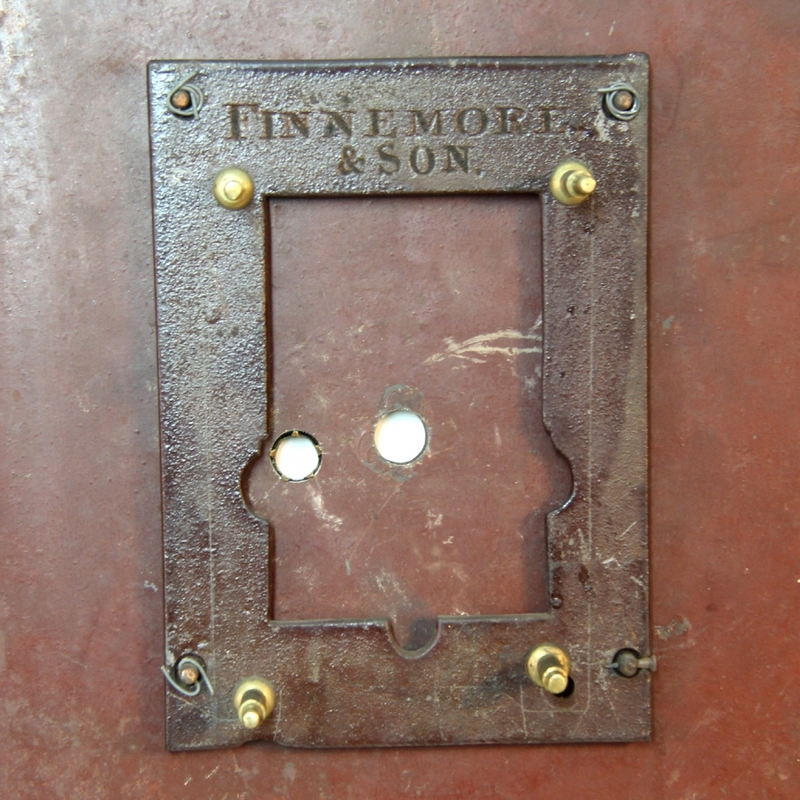 Behind an 18" diameter, bowed painted iron dial made by 'Finnemore & Son' of Birmingham. 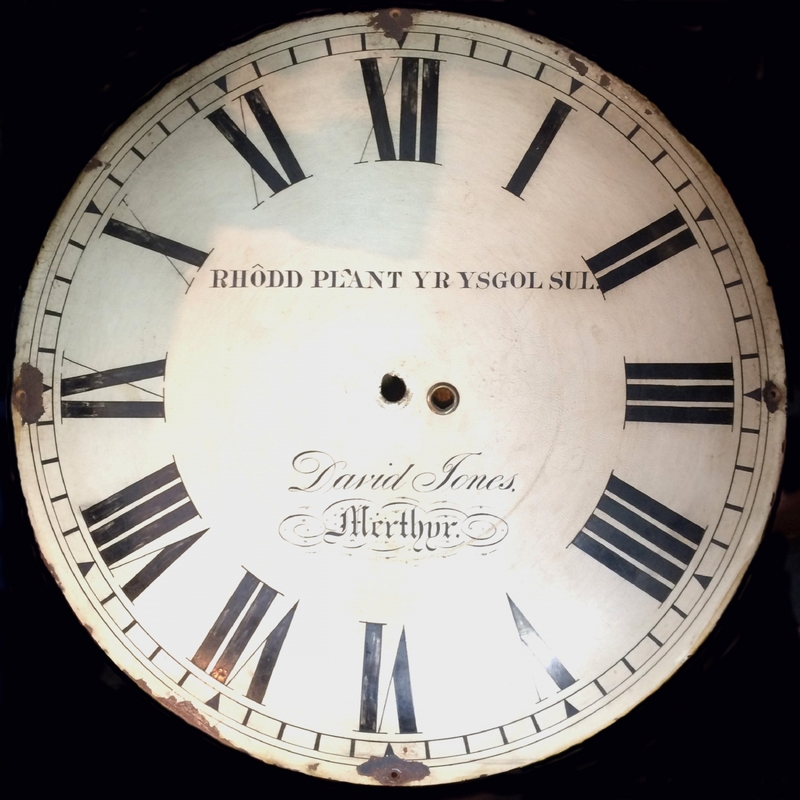 Having black Roman numerals, minute ring with outer circle and bearing the maker's signature "David Jones (of) Merthyr (Tydfil)" in large script and old English font between the dial centre and the VI numeral. Above the dial centre is written "RHODD PLANT YR YSGOL SUL." Which, translated from Welsh states "GIFT OF THE SUNDAY SCHOOL CHILDREN". Also having blackened brass 'Spade' hands and a heavy, cast brass bezel with bowed glass. 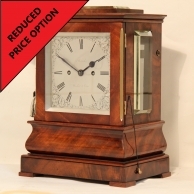 Contained in a mahogany case with quadrant moulded bezel edging and a rounded back-box bottom with a locking and cockbeaded door. Also having an access door to the right hand side. 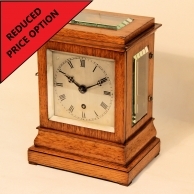 * This clock is featured in the book "Wales, Clocks & Clockmakers" by William Linnard and the maker has been researched by the author. 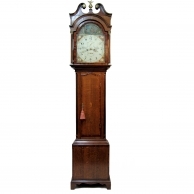 He states that David Jones was a self-taught Clockmaker (with obvious talent) who invented a Night Watch. 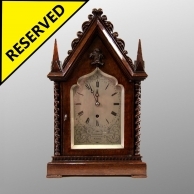 However, he also had a son by the same name who took over the business and it is the son who is more likely to have made this clock as the father would be aged 75. Instinct and experience tell me that this clock dates to about 1835 and Finnimore & Son (Dialmakers) were in business from 1828 until 1836. 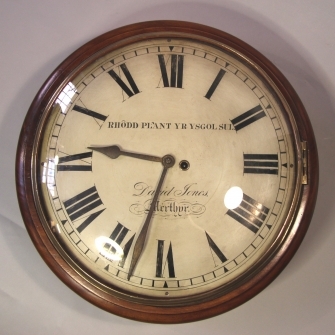 ** The book's photograph of this clock was taken in the Cardiff Clock Shop several years ago with the dial damaged at the fixing points. Our third picture shows the dial with damaged areas and we have removed the rust, filled the areas and carefully matched new paint to the original. This is because the dial remains untouched since manufacture. I felt it must only be carefully conserved to prevent further decay. The same applies to the bezel however, there is shrinkage damage to the case which we will correct. The movement is well maintained and in excellent order but it will be overhauled by us and labelled 'authentic' prior to its sale. Dimensions: 22" diameter x 8" deep including domed glass. Condition: Very original and beautifully aged. Investment forecast: 5 (The value is expected to increase by 50% over the next ten years).